Atelier Ten are delighted to be designing the engineering services for this new speculative commercial development. 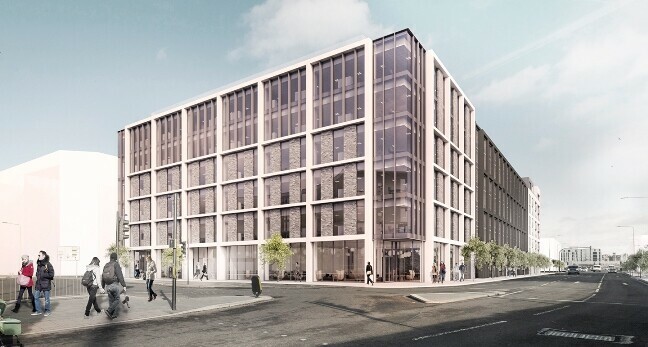 The office development forms part of the Plot 6 masterplan, designed by Cooper Cromar architects. The first phase to be constructed will include two ground floor retail/restaurant/leisure units with offices above. This faces south-west towards the new Railway Station. Works on this phase will take place throughout 2018 with an estimated completion date in spring 2019. Site clearance, investigation and detailed survey work commenced in February 2018. The development is part of an Atelier Ten commitment to deliver healthier working environments. This commitment will deliver a BREEAM Excellent accreditation with an A Rated Energy Performance Certificate.